These are one of my favorite “cookies” to make. First of all, they are warm tasting and soft. The spices make you feel all homey and there’s no hard crunch to contend with to break that mood. 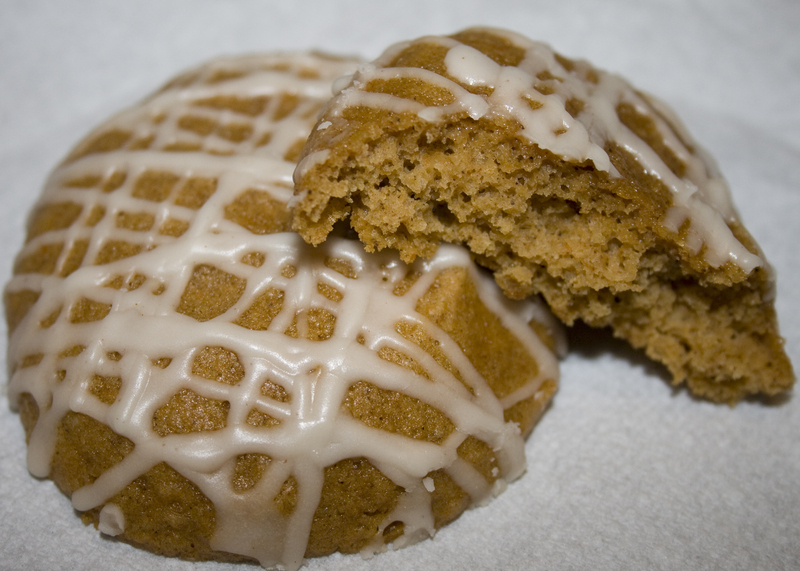 Secondly, they are practically guilt free since they’re made with applesauce and pumpkin. Really, they’re like eating a piece of fruit. Ok, not quite. Since all of the ingredients are soft, you can stir them up with just a solid wooden spoon, no need to dirty an electric mixer. Fourthly (is that a word?) they are muffin tops, without the fancy muffin top pan. How awesome is that? And finally, they are just amazingly delicious. Like portable pumpkin bread. Mmmmmm. I love love love them. You can use a combination of cinnamon, nutmeg and cloves in place of the pumpkin pie spice – but I just love that the spice blend just automatically makes these cookies taste like my favorite holiday pie. Preheat oven to 350 degrees F (175 degrees C). Lightly spray a cookie sheet with non-stick spray. In a medium bowl, cream together the 1/2 cup of applesauce and white sugar. Add pumpkin, egg, and 1 teaspoon vanilla to butter mixture, and beat until creamy. Mix in dry ingredients. Drop on cookie sheet by tablespoonfuls. I use a medium sized cookie scoop. Halfway between a melon baller and an ice cream scoop. Bake for 12 to 15 minutes in the preheated oven. Cool cookies, then drizzle glaze with fork.